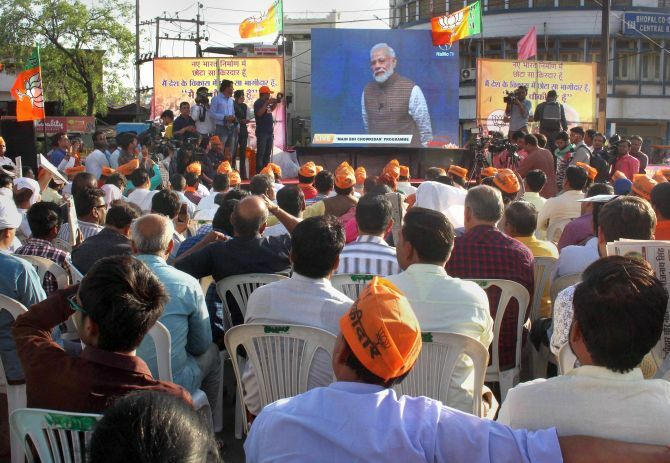 New Delhi, March 31, 2019: Prime Minister Narendra Modi addressed “chowkidars” across 500 locations in the country and also via television channels during his ‘Main bhi chowkidar’ campaign in the packed Talkatora indoor stadium here on Sunday. The PM said it is natural that the programme was being watched keenly given the coming Lok Sabha elections. Addressing a ‘Main bhi chowkidar’ event, he also said ‘Mission Shakti, demonstrating India’s anti-satellite missile capability, had nothing to do with polls and hit out at those opposing his announcement of it in an address to the nation. “The United States, Russia and China did ASAT tests openly, why should we have hidden it,” he said replying to question at the event that was beamed across the country at 500 places where gatherings of Bharatiya Janata Party workers, professionals, chowkidars (watchmen), traders, farmers among others listened to Modi and interacted with him through video-conferencing. Chowkidar is a spirit, a bhawna (feeling), he said invoking Mahatma Gandhi who talked of trusteeship. Everyone who works for the country is a chowkidar, he said. “The country has given me so much support in my endeavour that I have not looked back since then. I am sure the country wants a chowkidar not a raja, maharaja which is why the number of chowkidars is increasing and gaining strength ,” he told a cheering , enthusiastic crowd in the packed Talkatora stadium before the interactive session with the audience. 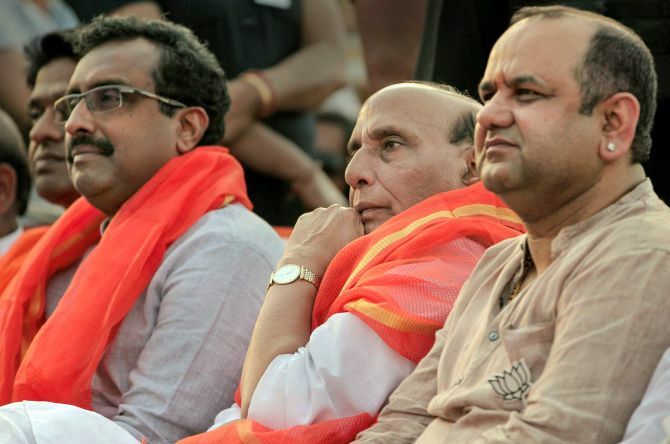 To a question from Mumbai on the Balakot air strikes, the prime minister said they were carried out by the country’s security forces and not by him. Modi said he took the decision for the Indian Air Force to conduct the air strikes as he thought that “the game” should be played from where terrorism is being remote-controlled. He said Pakistan is in a fix because if it acknowledges the air strikes, it will have to accept that there was terror camp there. Those abusing Modi on the air strikes are helping Pakistan with their statements, he said. Modi also said that a government with a clear mandate was very important. India’s voice is heard because it has a majority government, he said. He said the country’s first prime minister had expressed concern about poverty and had talked about eliminating it. “His daughter then took it ahead, the slogan (to remove poverty) as well as poverty. Her son also expanded the slogan and the country’s poverty,” Modi claimed. “His widow then ran the country using a remote control for 10 years and she also expanded poverty. Now her shehzaada is doing the same,” Modi said in an obvious reference to former prime ministers Jawaharlal Nehru, Indira Gandhi and Rajiv Gandhi, as well as former Congress chief Sonia Gandhi and current party president Rahul Gandhi. Modi urged first-time voters to see their track record as four generations have been talking about removing poverty over and again but have not been doing anything about it. “It is the job of the new voters to understand those who lie,” Modi said. He said the country does not need “rajas and maharajas” and it made him happy that the spirit behind ‘chowkidar’ (watchman) is expanding. On a question on corruption, the prime minister said those who have looted the country will have to “return every single penny” and the property of defaulters in any corner of the country, will be confiscated. “I pledge no one looting the country will be spared,” Modi said, making indirect references to alleged economic offenders such as Vijay Mallya and Nirav Modi. “From 2014 to 2019, I took some people to the threshold of jails. But I need more time to take them inside. I need your blessings. In the coming time, I am going to be stricter with those who are looting the country,” he said. Asked by an IT professional from Bengaluru if India will be counted among developed countries, Modi said India has all the resources to become a developed country. Today, India is sixth largest economy and knocking at the doors of becoming a $three trillion economy, he said. “I want to take the country to the five trillion dollar economy club and it has to be made into an economic superpower,” he said. “I have full faith that we will take the country to new heights. In 2022, the country will complete 75 years of Independence. There will be no family in 2022 that will not have its own pucca house. It is my dream that the income of farmers doubles by then. These are the things we have to stress on for entering the five trillion dollar economy club,” Modi said. On criticism of his Mission Shakti address to the nation, Modi said it had nothing to do with elections. “It’s an achievement of our scientists. When the US, Russia and China did it openly, why should we have done it clandestinely,” he said. Mission Shakti is a matter of pride for India but some have problems because Modi did it, he said. The prime minister also alleged that the Congress’s lies were seasonal as during the Delhi assembly polls they created the “lie of intolerance” and in Bihar assembly polls they said Modi will take back reservation. Some people are not able to digest the fact that a chaiwala became a prime minister, Modi said. 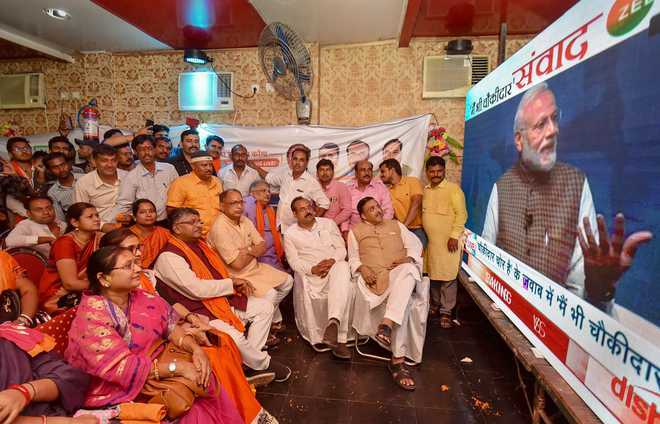 Several BJP bigwigs, including party chief Amit Shah and Union ministers Rajnath Singh and Sushma Swaraj, also took part in the ‘Main Bhi Chowkidar’ campaign via video-conferencing.